Done on a 2 feet by 2 1/2 feet canvas the game is attractively designed and appealing. All the snakes in the games have names such as Bakasura, Kumbakarna etc. which are representative of certain vices. 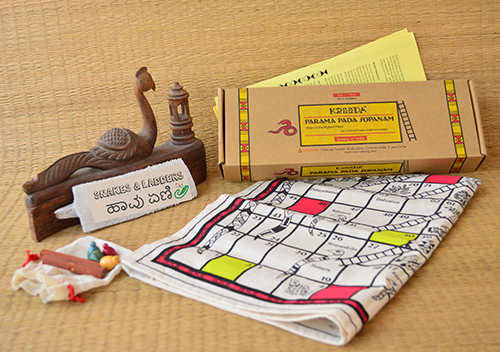 A The Indian version of Snakes and Ladders, this game set comes on a large (2 x 2.5 feet) canvas. Each snake is named after an Indian mythogical character, and represent different vices. The set comes with a booklet that throws light on the backstories of these characters.